(1) A leaf, mostly pl., Il.2.312, Od.19.520, Hes.Op.486, 680, Alcm.39, Alc.39, E.Hel.244 (lyr. ), etc. ; εὐδαιμονίας πέταλον, of the Olympian wreath of wild olive, B.5.186;ἁβρά τε λειμώνων π. flowers, AP7.23 (Antip. Sid.) : rare in Prose, X.An.5.4.12, Cyn.9.15 ; used in divination, Phld.D.1.25 : sg. in Ael.VH5.16 ; poet., νεικέων πέταλα contentious votes (cf. πεταλισμός), Pi.I.8(7).46 ; Ὠκεανοῦ πέταλα, of springs, Id.Fr.326. (2) (a) leaf of metal, χρυσίων πέταλα IG12.374.283 ; πέταλα χρυσᾶ ib.22.1394.5 ; π. χρυσίῳ ἐπίτηκτα Inscr.Délos 442 B138(ii B. C.), cf. Dsc.5.79, Luc.Philops.19 ; used for gilding the horns of victims, IG22.1635.36 : sg., π. χρυσοῦν LXX Ex. 28.32(36) ; π. πύρινα, of the stars, Placit.2.14.4. (b) slice, ῥαφανῖδες κατατμηθεῖσαι εἰς πέταλα Orib.Fr.81. the strength of Pelops, and Pisa, where glorious Pherenicus won victory in the race with his feet, and returned to Syracuse with its fine towers, bringing to Hieron the leaf of good fortune. Πέλοπός τε βίαν, καὶ Πίσαν ἔνθ ὁ κλεεννὸς [πο]σσὶ νικάσας δρόμῳ [ἦλθ]εν Φερένικος <ἐς> εὐπύργους Συρακόσσας Ἱέρωνι φέρων [εὐδ]αιμονίας πέταλον. to give birth to the nectar-filled leaves above your head. φύσει ὑπὲρ κρατὸς νεκτάρεον πέταλον. Muse of the sacred dances, advance and come to enjoy my song, to see the great throng of people, where wits sit by the thousand more honorable than Cleophon, on whose babbling lips roars terribly a Thracian swallow sitting on an alien leaf [a barbarian leaf]. She rumbles her sorrowful nightingale’s song, since he will perish even in case of a tie [a reference to games]. μυρίαι κάθηνται φιλοτιμότεραι Κλεοφῶντος, ἐφ᾽ οὗ δὴ χείλεσιν ἀμφιλάλοις δεινὸν ἐπιβρέμεται Θρῃκία χελιδὼν ἐπὶ βάρβαρον ἑζομένη πέταλον: κελαδεῖ δ᾽ ἐπίκλαυτον ἀηδόνιον νόμον, ὡς ἀπολεῖται, κἂν ἴσαι γένωνται. While the use is a bit more poetic than other terms for a wreath worn on the head, such as the Latin corona and the Greek equivalent στέφανον, it is natural enough and is attested in Greek literature. This should alert us to the possibility of people wearing το πέταλον that is indeed made of leaves and not gold. Here are some coins showing this. This coin dating 139-144 AD depicts Marcus Claudius Fronto, “asiarch and high priest of the Thirteen Cities” (ACIAPX KAI APX IΓ ΠOΛЄΩN). This coin shows the same man, “asiarch and high priest of the Thirteen Cities” (ΑΣΙΑΡΧΟΥ ΚΑΙ ΑΡΧΙΕ[ΡΕΟΣ] ΓΙ ΠΟΛΕΩΝ). Of course, the asiarch was not the only one to be shown laureate, as the bust at the beginning (Claudius) and the coin here (Marcus Aurelius) shows. It does, however, imply status and is consistent with the office of the asiarch. And it [Tralles] is as well peopled as any other city in Asia by people of means; and always some of its men hold the chief places in the province, being called Asiarchs. τινες ἐξ αὐτῆς εἰσιν οἱ πρωτεύοντες κατὰ τὴν ἐπαρχίαν, οὓς Ἀσιάρχας καλοῦσιν. A precious account of the election of a chief priest of Asia is offered by Aelius Aristides. In 147 C.E., Aristides went into the assembly at Smyrna and was offered ‘the common priesthood of Asia,’ presumably the city’s nomination as its candidate for chief priest. Though he at some point had a dream (Oration 50.53) in which someone in Smyrna hailed him as ‘Asiarch,’ Aristides was unwilling to serve. He tried to scotch the plan, and believed he had succeeded, but later on the Smyrnaean delegates went to the koinon meeting at Laodikeia, and Aristides came in third or fourth in the balloting, i.e., was elected. This implies that, had he not wheedled an exemption from the governor of the province, he would have become chief priest of the third or fourth city out of the five possible in Asia (see below). Aristides’ account does not tell us whether the chief priests were considered to be of equal or unequal rank: though the first one elected could have been allotted the most honorable place, it is also possible that the electees drew lots for assignments. Fayer believed that the provincial chief priest at Pergamon held precedence over the others, as he had been the koinon’s first chief priest, originally known as the chief priest of Rome and of Augustus. Campanile guessed that there were three or four chief priests of Asia, equal in rank to one another, though she correctly observed that they did not necessarily preside in the temples in their own cities or judicial district centers; a chief priest could serve two different terms in two different cities. She took her number from Dio Chrysostomos, who in the satirical address to the Apameans mentioned above referred to ‘three or four long-haired men,’ whom he compared to chief priests of Asia; but this reference is too vague to be an argument either for the chief priests’ number or equality in rank. Though documents mentioning their offices are abundant, chief priests of Asia or chief priestesses or Asiarchs are specified as presiding over temples in only five cities: Pergamon, Smyrna, Ephesos, Sardis, and Kyzikos. That these temples also made their cities neokoroi is clear: when the title changes from, e.g., ‘chief priests of the temple’ to ‘chief priests of the temples,’ the city in question also goes from being neokoros to twice neokoros, as happened to Pergamon under Trajan, to Smyrna and Ephesos under Hadrian, and to Sardis under Antoninus Pius (the change is not documented for Kyzikos, whose second neokoria remains problematic). Three of the five cities possessed the earliest provincial temples in Asia yet documented: Pergamon that of Rome and Augustus, Smyrna that of Tiberius, Julia, and the Senate, and Ephesos that of the Augusti, completed in the time of Domitian. The first imperial temple of Sardis, however, is not yet datable, and that of Kyzikos was probably the great temple of Hadrian. So the five cities in which chief priests or Asiarchs served may represent the first five possessors of provincial imperial temples, and later were named neokoroi for those and for any additional temples. There are many neokoroi in Asia that are never documented as having a provincial chief priest, chief priestess, or Asiarch of their temple(s), however, and it may be that cities that received their first neokoria later, such as Laodikeia under Commodus, did not have provincial chief priests assigned or elected. So the number of chief priests of the Asian koinon was likely limited to five sometime after Hadrian (Kyzikos’ first temple) and before Commodus. Burrell goes on to note that Philadelphia and Tralles, among other cities, would vie for the titles of metropolis and neokoria, with the specific benefit that these additional neokoria were exempt from supporting financially the temples in the five long-established neokoroi, which acted as regional centers, drawing tribute from their regions. And even some of the Asiarchs, who were friends of his, sent to him [Paul] and were urging him not to venture into the theater [in Ephesus]. τινὲς δὲ καὶ τῶν Ἀσιαρχῶν, ὄντες αὐτῷ φίλοι, πέμψαντες πρὸς αὐτὸν παρεκάλουν μὴ δοῦναι ἑαυτὸν εἰς τὸ θέατρον. The use by Strabo and in Acts suggests that the term Asiarch was used for elders in cities in Asia generally, not just the few who would also be called “chief priests” of Asia in designated cities where the imperial cult had been established. We see the separate title of chief priest (ἀρχῐερεύς) on at least one coin above (ΑΡΧΙΕ, abbreviated, applied to Marcus Claudius Fronto). Another appearance of the term is found in the Martyrdom of Polycarp in the mid-second century. When this had been said by the herald, all the multitude of heathen and Jews living in Smyrna cried out with uncontrollable wrath and a loud shout: “This is the teacher of Asia, the father of the Christians, the destroyer of our Gods, who teaches many neither to offer sacrifice nor to worship.” And when they said this, they cried out and asked Philip the Asiarch to let loose a lion on Polycarp. But he said he could not legally do this, since he had closed the Sports. τούτου λεχθέντος ὑπὸ τοῦ κήρυκος, ἅπαν τὸ πλῆθος ἐθνῶν τε καὶ Ἰουδαίων τῶν τὴν Σμύρναν κατοικούντων ἀκατασχέτῳ θυμῷ καὶ μεγάλῃ φωνῇ ἐπεβόα· Οὗτός ἐστιν ὁ τῆς Ἀσίας διδάσκαλος – ὁ πατὴρ τῶν Χριστιανῶν – ὁ τῶν ἡμετέρων θεῶν καθαιρέτης – ὁ πολλοὺς διδάσκων μὴ θύειν μηδὲ προσκυνεῖν. ταῦτα λέγοντες ἐπεβόων καὶ ἠρώτων τὸν Ἀσιάρχην Φίλιππον ἵνα ἐπαφῇ τῷ Πολυκάρπῳ λέοντα. ὁ δὲ ἔφη μὴ εἶναι ἐξὸν αὐτῷ ἐπειδὴ πεπληρώκει τὰ κυνηγέσια. The association of an Asiarch with someone in charge of the games is made clear here. The 21st chapter, which might have been added by another author, identifies Philip as also being “high priest.” While it might not be accurate, since the chapter seems to be an appendix added later, it does show an association that asiarchs held with the Greek priesthood. Packard Humanities Institute has a helpful epigraphic database, with many entries for asiarchs. The interpretation that is most congruent with the extant evidence regarding the Asiarchate is Magie’s conclusion that the title of Asiarch was used for a special category of leitourgia in Asia that could encompass a variety of responsibilities. It is not known how the title was accorded, but it clearly corresponded to municipal and not provincial duties. The easy equivalence some people make between “Asiarch” and “high priest” cannot be sustained. They are separate offices, one with a municipal function (connected to the city in which the Asiarch lives) and another with a provincial function (that came to be centered on the regional centers of the imperial cult in Asia). Some of the chief priests of Asia undoubtedly carried the more common title of Asiarch, while just as surely several Asiarchs had no connection with the high priesthood. Both Strabo and the Acts of the Apostles suggest that there may be many Asiarchs in one city. The facts that women were almost entirely excluded from being Asiarch and that they held their office for a limited period of time, although often resuming the office several times, suggest that the function of voting on municipal matters fell to the Asiarchs. Their various association with construction, the mints, the temples, and the games further suggests that they were expected to contribute to the welfare of the city out of their own munificence. In summary, then, they appear to accept the privilege of having a say in local affairs along with the responsibility of supporting local functions such as building public structures, minting coins, temple service, and ceremonial sports. The significance of wearing a wreath should not be lost on us today. It is a Greek tradition to wear it that was socially acceptable for certain people at certain times. It was not merely ornamental, nor did even most men of high status consider it appropriate for wear at all times. One of the honors voted to Julius Caesar by the Senate was the privilege of wearing a laurel wreath on all occasions. Dio Cassius tells us that Augustus was granted the right to wear the triumphal crown (corona triumphalis) at all festivals in 29 BC. Later, in 25 BC, he was voted the privilege of being able to wear it on New Year’s Day. 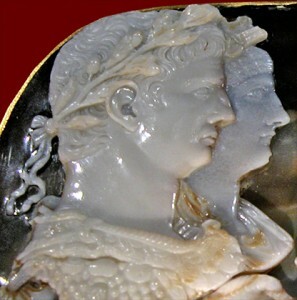 Caligula wore the oak leaf crown at public spectacles. Further on they add, “Many sculptures of priests and priestesses from the second through the fourth centuries wear crowns, incorporating rolled diadems, fillets, and/or laurel wreaths, atop damaged and thus unidentifiable busts.” One example of this can be found in the funerary monument of the priest Tibol, from Palmyra in Syria about 150-200 AD, pictured here. Plants, which were braided in wreaths, could have been dedicated to various deities: oak to Zeus, laurel to Apollo, herbs to Ceres, vine to Dionysus, and myrtle to Venus. Athletes, poets, soldiers, and winners were awarded with wreaths, which were also symbols of art, literature and education in Roman society. Priests bore them on the head or around the neck, in order to signify important dates and celebrate religious festivals (Hunter, 2000, 4). Laurel wreath represented the medium through which divine power was transferred (Gerbran, Ševalije, 2004, 511). Laurel grew inside of the Delphi shrine, supplying clergy with leaves that they were chewing before prophecy. Its branches were used for cleaning sacred places. Laurel branches were held by the priests, as well as prayers, and also by people in the parades. Branches were also used to decorate houses and portals. Laurel wreaths were granted to the winners of Pythian Games, physicians, and poets. In the first place, there is a contrast between crown of thorns, with which the winner over the death – Christ was crowned, and the laurel wreath of triumphal Ro-man emperors. The striking difference, which was supposed to indicate the origin of the triumph character, i.e. profane triumph (the imperial power, authority, victory in war) and sacred triumph (Christ’s victory over death and resurrection, through which the fate of mankind was saved). Later, when the Christian religion and philosophy became an instrument of power, Constantine’s vision before the battle on the Milvil Bridge appeared, in which he saw initials of the Christ name (Chi Rho), within laurel wreath (Lactantius, 19, 27, 1-2; Eusebius, 1961, 28-29; Eusebius, 1989, 33). As he was told in vision – with that sign he would win, it is possible that the laurel wreath regained symbolic strength and power, which it once had, but now in a different, Christianized context. It was easy to transfer that form of winning the battle to the entire victory of Christianity, and from thereto the victory of the resurrection. Ammianus Marcellinus named the wreath, which was worn by the person who made the sacrifice, as Corona Sacerdotalis. It was worn by priests and their ministers. It is not certain what it was made of, but most probably it was an olive or gold wreath. Sometimes it was made of corn ears. A wreath made from olive would, significantly, also be awarded to winners of games (ibid., p. 348). As an award, the winners of the Olympic Games were given with kotinos (Greek- κότινος), wreath made of sacred olive branches that grew behind the temple of Zeus. It has a variation in which it is made only of olive or laurel leaves (ibid., p. 348). Unlike those wreaths made of entire branch, Corona Tonsa or Tonsilis was made only of olive or laurel leaves (Rich, 1875, 363). It is not surprising, then, that we find the πέταλον also appearing in the context of the games. Victors in the games and Greek priests performing sacrifices both wore wreaths made from olive or laurel leaves. In mainland Greece, priests were elected to their office and served limited terms. In Asia, while some places followed the practice of mainland Greece or oscillated between the two options, there arose a practice of appointing priests for life. These appointments were highly prized, not least for being lucrative, and they were controlled through a combination of heredity and the sale of the office by the cult of a temple. As a rule, the priests bought their posts for life, which is expressed by terms such as mexri biou, ews zhn, ews zwhs, xronon osn am bioi, tom bion ton autou, dia biou, etc. Some of the priesthoods were even hereditary, being assigned dia genous. Exceptions to the rule – a priesthood of the Roman demos and the goddess Roma sold (loutron). We learn that, as was common, foreign initiates paid considerably more for the priestly service than citizens did. Ephesus was one of the cities where the sale of the priesthood took place, as “the Roman proconsul of Asia in AD 44, Paullus Fabius Persicus, criticized the Ephesian practice of selling priesthoods ‘as if at an auction’ and complained that ‘the best candidates’ were not appointed.” While the proconsul was heeded, we do not know if the change was permanent. The cult of the temple derived significant income from these sales, which would otherwise be lost if priests were assigned annually by election. Sale of the priesthood in Asia continued until approximately the 3rd century AD. The monument is [that] of Gaius Octavius Magnus, presbyter. τὸ μνημεῖόν ἐστιν Γαΐου Ὀκταβίου Μάγνου πρεσβυτέρου. The companions of the presbyter Ophelion and friendly acquiantances honor Sacerdotal Menander the high priest, and their own gymnasiarch for life shows kindness through the donated base of a stele that Themistocles Lusikleus and Phoebe erected on behalf of the public. οἱ τοῦ πρεσβυτέρου Ὠφελίωνος ἑταῖροι καὶ συνήθεις φίλοι ἐτείμησαν Σακέρδοτα Μενάνδρου τὸν ἀρχιερέα καὶ γυμνασίαρχον τὸν ἑαυῶν διὰ βίου εὐεργέτην ὑποσχομένου τὸν τελαμῶνα δωεὰν ἀναστῆσαι ὑπὲρ τοῦ κοινοῦ Θεμιστοκλῆς Λυσικλέους ὁ καὶ Φοῖβος. This inscription in Pisidia identifies one Bianor who is a high priest of Sebastos (Greek for the Latin Augustus) and an elder (presbyter). What the first inscription shows is that it would not be unusual for a funerary inscription to note that a person was an elder in his lifetime. The other one suggests that a Greek who was a priest (ιυρευς) could also be an elder (πρεσβύτερος). Both could at times overlap with the office of Asiarch (Ἀσιάρχης), and someone who held more than one of these titles could be referred by only one of them in epigraphic or numismatic evidence. Ἔβενος πρωταύλης Ἱεροκλῇ τῷ ἰδίῳ συριστῇ ἐκ τοῦ ἰδίου τὸ μνημῆον. χαῖρε. Ἰούλιος Κόϊντος, στρατιώτης ἐπίτροπος, Διοδωρὶς Ἀρείου μήτηρ καὶ κληρονόμος ἐκ τῶν ἰδίων αὐτοῦ μνήας χάριν. Thus it is not unknown for funerary inscriptions to mention some key details regarding a person’s life and career. Naturally, in the Christian era, plenty of funerary inscriptions would mention the deceased’s ecclesiastical role, such as presbyter. An 8th century text (Mingana Syriac 540) refers to “two graves in Ephesus – one concealed, namely the Evangelist’s, the other being that of John his disciple, who wrote the revelation.” The concealment here may refer to a building on its spot, as there was a basilica dedicated to John the evangelist in Ephesus. The effect of all these references is to make it clear that there were two funerary monuments assigned to John in Ephesus, one of which the Christians regarded as clearly belonging to John the apostle and evangelist, with the other one mentioning John the presbyter, which some speculate to be the author of Revelation, John of Patmos, or the shorter epistles, now ascribed to John, attributed to the “elder” in the New Testament. It has already been established that it is plausible that a second century Greek person in Asia Minor could be described as an elder (presbyter) on his funerary inscription. If there were a historical John the elder who came to rest at Ephesus, we would indeed expect nothing else. Given the manner in which Papias speaks about John the elder, it must be supposed both that he existed and that he was near enough to Hierapolis for Papias to expect word of things he was saying. The existence of a grave dedicated to him is confirmed by several sources, which themselves describe it as something that is generally known, presumably because pilgrims would visit the site. All of this bodes well for a hypothesis whereby John the elder was interred at Ephesus and received a funerary inscription mentioning him and his title. We have already seen the plausibility of the hypothesis that there was a tomb inscription dedicated to John the elder. Living in Ephesus, Polycrates would have seen it. Coming from Asia Minor, Irenaeus may also have seen the inscription. Irenaeus is credited with writing the Martyrdom of Polycarp, in which we find a description about Polycarp of Smyrna (ch. 19) somewhat similar to the one Polycrates gives to John. He was not only a famous teacher, but also a notable martyr, whose martyrdom all desire to imitate, for it followed the Gospel of Christ. By his endurance he overcame the unrighteous ruler, and thus gained the crown of immortality. οὐ μόνον διδάσκαλος γενόμενος ἐπίσημος ἀλλὰ καὶ μάρτυς ἔξοχος, οὗ τὸ μαρτύριον πάντες ἐπιθυμοῦσιν μιμεῖσθαι κατὰ τὸ εὐαγγέλιον Χριστοῦ γενόμενον. διὰ τῆς ὑπομονῆς καταγωνισάμενος τὸν ἄδικον ἄρχοντα καὶ οὕτως τὸν τῆς ἀφθαρσίας στέφανον ἀπολαβών. John is likewise described by Polycrates as μάρτυς και διδάσκαλος. Whereas John is described as a priest (ιυρευς) who bore (πεφορεκως – a term typical of external ornamentation such as a diadem or wreath) the leaf (το πέταλον), here Polycarp in his martyrdom gained (ἀπολαβών) the crown (στέφανον) of immortality (ἀφθαρσίας). While it’s interesting to draw a parallel here, the contrast is just as stark. Polycarp gets a crown of immortality in his death as a martyr. John goes about wearing a physical symbol of his function as priest. Even the word μάρτυς is not a strict parallel because in the text about the Martyrdom of Polycarp it has taken on its function as a technical term for witnessing unto the pain of death. In the text of Polycrates, John sleeps at Ephesus. In a description that is most congruent to the general tradition about John being one who didn’t suffer the death of martyrdom, the role of John as a teacher comes between the idea of his witness and the statement of his resting place. The idea of a “witness” is present as a self-reference in several writings that were attributed to John (Revelation, 1 John, and Gospel of John), and this is the natural context for interpreting Polycrates here. The solution presented here, despite the necessity of providing a great deal of relevant background material for its context, is actually rather simple. Polycrates of Ephesus is copying his description of John from a source. That source is one that we have posited as a plausible hypothesis on other grounds and one that, if it existed, Polycrates would have surely read. That source was the inscription regarding John the elder. It is probable that the inscription called John presbyter, since that is found in statements from both Eusebius and Jerome. One could argue that Jerome simply copied Eusebius except that his argument is a different one, where people have argued that 2 and 3 John (rather than Revelation) belong to the “elder” of the inscription, a fact that most clearly points to the term belonging to this inscription being about a presbyter John. Based on further parallel regarding a crown or leaf and the otherwise unexplained statement by Polycrates that John was a priest who wore it, we may suppose that there is something more. Which would have been original? It is quite difficult to read a statement about a metaphorical crown of immortality and derive from that a statement about a priest that wears a crown or wreath. The derivation, if anything, runs the other way, from the literal (John wearing a crown of leaves) to the metaphorical (Polycarp wearing a crown of immortality). Let us then present the solution suggested here in the form of what might have been (in essence) the text of the funerary inscription belonging to John the elder. Of the word of God. Rejoice. τοῦ λόγου τοῦ Θεοῦ. χαῖρε. While any such suggestion is necessarily speculative, the elements of the suggestion that are essential to the hypothesis is that this inscription could have been the inspiration for the description of John in Polycrates of Ephesus. Without going overboard with commentary on a putative reconstruction, we can see from this particular suggestion that Polycrates has faithfully copied his source, accommodating the word order to his own presentation and adding an identification of this John with the disciple described in the Gospel of John. This particular suggestion about the inscription involves a contrasting parallel drawn between John’s conversion from his former life lived as a Greek elder with its perishable acclaims signified by the leaf crown to his new life as a witness and teacher of the word of God (cf. 1 Cor 9:25). To be absolutely clear, my understanding of this suggestion is that this John was both a Jewish priest and a Greek elder (specifically, an Asiarch at Ephesus, like the ones mentioned as friends of Paul in Acts 19:31). He thus simultaneously had a birth-given identity as a Jew from a priestly family and a prestigious role in the society of Ephesus as an Asiarch where, at functions, such as the arena or the theater or the gymnasium for example, he would wear the Greek wreath made of leaves. Such a dual role might have been difficult at times, and my suggestion is further that it turned out to be rather difficult. That John the presbyter existed in Asia Minor is inferred from Papias. That John was a presbyter on the inscription is derived from Jerome and Eusebius. The other significant elements of the inscription above are inferred from Polycrates, who lived in the city of Ephesus and speaks of John sleeping there (i.e., dead in a tomb); specifically, that John was a witness, a teacher, and a priest. These elements find some echo in the description of chapter 19 of the Martyrdom of Polycarp. As a premise to this essay, already growing long, Revelation is taken to be a genuine piece of writing in the reign of Domitian. From this, it is inferred that the author was named John, that he was in exile at Patmos, and that he was writing an apocalypse of Jesus Christ to be distributed among churches in the province of Asia. With Tertullian’s description in A.H. 36.3 of this John with the legal language in insulam relegatur (island exile), Tertullian implies that John belonged to the class of honestiores and received a punishment of exile instead of death because of his legal status. While Tertullian in all likelihood had himself inferred this from Revelation, it is a realistic and most plausible conclusion given the legal context of the punishment of exile in the Roman empire. John’s status would make him an attractive target for informers (delatores) seeking a bounty (praemium), which explains why John particularly is exiled instead of all the Christians and Jewish Christians in the churches to which he writes. It also explains why one witness, John, is exiled while another witness, Antipas, has perished (Rev 2:12). The question becomes whether there is an identity among the John of Patmos who wrote in exile, the John of Polycrates who was a priest, and the John the elder who left a funerary inscription at Ephesus. It can’t be proven, but it is the most economical explanation of all the data so far considered. To test the hypothesis, let us turn to the text of Revelation itself. We’ve already noted the Revelation’s implication of status for John, something consistent with the description of John as an elder. We can further note the emphasis on witness and testimony in Revelation (Rev 1:2, 1:5, 1:9, 2:11, 3:14, 6:9, 11:3, 11:7, 12:11, 12:17, 15:5, 19:10, 20:4). Along with 1 Peter, Revelation among the texts of the New Testament implies that believers in Jesus Christ would become priests (Rev 1:6, 5:10, 20:5), suggesting a high view of the priesthood that would be inculcated in someone from a priestly family. The only references to teaching are negative, and it is for this reason that my putative reconstruction of the funerary inscription has added an adjectival phrase to the title of teacher drawn from Revelation 1:2, “of the word of God.” Given a close correspondence on three points (high status, witness, priesthood) and a loose correspondence on a fourth (teaching), the hypothesis about John the elder’s funerary inscription is consistent with the hypothesis that a similar inscription was left by the author of Revelation. Based on such an economical hypothesis, we can easily then infer that this John refused to join in officiating the imperial cult instituted in Ephesus under Domitian (around 90 AD) but was spared death because of his station in life and exiled to Patmos. He would have returned to Ephesus along with other exiles under Nerva (as recorded by Dio Cassius) and passed away there under Trajan, which happens to be what church tradition (starting from Irenaeus) says about John. It must be emphasized that this is not the only possible reconstruction of events that could lie behind this reference from Polycrates of Ephesus. There are at least three others, but I suggest that this fourth hypothesis, that John was both a Greek elder and a Jewish priest, as recorded on his funerary inscription, best explains the origin of the reference here. Hypothesis (1). That John was believed to be a Jewish high priest in the succession by Polycrates because of the reference in Acts 4:6 (“Annas the high priest, and Caiaphas, and John, and Alexander”). Hypothesis (2). That John was believed to be a Jewish high priest by Polycrates in the same manner as was James the Just, who entered the holy of holies of the temple before the siege of Vespasian. Hypothesis (3). That John was believed to be a Greek high priest (ἀρχῐερεύς) of Asia by Polycrates. Hypothesis (4). That a source, particularly suggested to be John’s funerary inscription, was copied by Polycrates (who may have understood it correctly, understood it not, or misunderstood it). (1) It runs aground when considering the historical context. After 70 AD, the Temple no longer functioned as such. Before 66 AD, Josephus gives us the names of the high priests in Jerusalem in the first century AD. The identification of John with Jonathan the high priest is already an inconsistency. Even worse, however, is the idea that Polycrates would see in the John who was persecuting the church in Acts 4:6 the one who had lain on the Lord’s chest. (2) James the Just may have entered the holy of holies, as told by Hegesippus in the quotes from Eusebius, just before the siege by Vespasian. If he weren’t killed after being thrown off the temple, as also told by Clement of Alexandria, the events of the siege would likely do the job for someone who was playing a leadership role as the high priest. Epiphanius in Panarion 29.4.3 explicitly says that James entered the holy of holies, and an opportunity to do so during the first Jewish revolt is suggested on analogy with the actions of the Hasmoneans. John the evangelist was already believed by Irenaeus to live until the time of Trajan, which is consistent with the timeframe of the real John known to Papias and of the real John who authored the Revealation. The fact of John’s existence after 70 AD must have been understood by Polycrates, who was himself born around 130 AD and lived in the province of Asia. (3) Polycrates himself identifies John as the disciple who rested on the Lord’s chest, so it is impossible for him to believe that he was acting as a regional high priest in the imperial cult or to Artemis. Nor can we easily understand from the Jewish author of Revelation, in whom we have seen an identity with this John the elder who left an inscription, that he actually has a religious background in the Greek cults. Nor would we expect this to be the only mention of the startling fact if this were written on a public inscription regarding John in a bustling metropolis where Christians lived. (4) The fourth hypothesis thus remains that Polycrates is quoting a source here. The source may have been quite literally quoted, per the putative reconstruction, although that is neither necessary nor provable. The source may or may not have been understood as originally intended. The ambiguity in the statement provided by the source, however, leads to a difficult conjunction of conclusions: John was not a Jewish high priest, John was not a Greek high priest, but John was a priest who wore the πέταλον. The resolution of this difficulty leads us to the hypothesis that this John was both a Greek elder in the city of Ephesus and a Jew by birth from a priestly family, something that would finally explain all the data including the similar indications regarding the John who wrote Revelation. Because there is independent evidence of its existence through the comments of Eusebius and Jerome regarding a second funerary monument to John the elder in Ephesus that is visited by Christians but does not clearly regard John as the evangelist and apostle, a hypothesis that identifies Polycrates’ source with the funerary inscription of John the elder meets the requirement of Ockham’s razor.